Here at Illinois Retina, we treat more than diseases of the eye. We treat the person. We don’t use a one-size-fits-all approach. We listen to the needs, desires and goals of our patients, then create the best plan of care. It’s wonderful to be part of a group of highly talented physicians whose combined knowledge and expertise make a profound impact in the lives of our patients. Serge de Bustros, M.D., is a nationally recognized retina expert who has dedicated his career to treating patients and teaching future retina specialists. Dr. de Bustros serves as an Associate Professor of Ophthalmology at Rush University Medical Center. He has been with Illinois Retina Associates since 1990. While working on his medical degree at American University of Beirut in Lebanon, Dr. de Bustros at first considered a future in internal medicine and oncology. As his studies continued, he was drawn to a career in retina because it enabled him to work with his hands and produce more tangible results for his patients. Following an internal medicine internship at American University, he completed an ophthalmology residency and fellowships in medical and surgical retina at the famed Wilmer Ophthalmological Institute at the Johns Hopkins University and Medical Center in Baltimore. He then joined the full-time faculty there, where he was appointed Assistant, then Associate Professor of Ophthalmology and Director of the Eye Trauma Center. After a decade of training and teaching at one of the most prestigious ophthalmological institutions in the nation, Dr. de Bustros joined Illinois Retina Associates. He is also Medical Director of The Retina Center in Munster, Indiana. Dr. de Bustros is certified by the American Board of Ophthalmology. With his strong academic background, Dr. de Bustros has been committed to clinical research throughout his career. 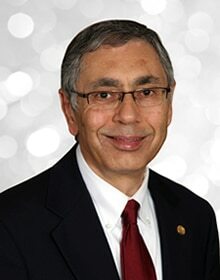 He has served as chairman, reviewer, principal investigator and co-investigator in numerous research projects and clinical trials through the National Institutes of Health, National Eye Institute and other organizations. Dr. de Bustros has also been an active writer and advisor. He has authored or co-authored nearly 100 articles and abstracts in leading academic specialty journals, and has written chapters for more than a dozen textbooks. A recognized expert in the field of retina, Dr. de Bustros has served on a number of national committees, including the Advisory Board of the National Eye Trauma System and the Special Review Committee SRC-02 of the National Eye Institute, and is a scientific referee for several academic journals. He has been involved in the production of two scientific films and is a member of numerous professional societies and organizations such as the Alpha Omega Alpha Honor Medical Society, American Academy of Ophthalmology, the Macula Society, the Retina Society and the American Society of Retina Specialists. Dr. de Bustros is the recipient of several awards and honors, including the Honor Award from the American Academy of Ophthalmology. Dr. de Bustros is on staff at several Chicago-area hospitals and sees patients at Illinois Retina’s Flossmoor, Orland Park and Munster, Indiana office locations.